This article is for myallocator properties that want to activate TripConnect instant booking, meaning you are allowing TripAdvisor to take bookings for your property through their website. If you are looking to activate Cost Per Click, where TripAdvisor directs traffic to your website to complete the booking, please click here. The InstantBooking feature is only available to guests booking from USA, United Kingdom, Australia, Canada, India, Ireland, Malaysia, New Zealand, Philippines, Singapore and South Africa. If your guests book outside of these countries, your property will not display the Instant Booking option. TripConnect instant booking is an easy-to-activate new channel, but it works slightly differently than other channels. 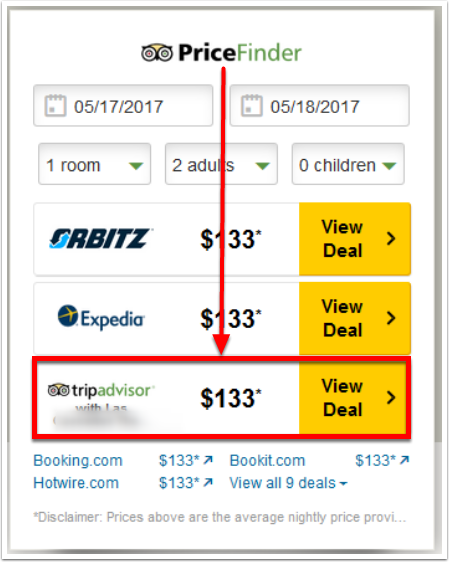 TripAdvisor uses all settings in myallocator to update your information on TripAdvisor's website. This means you need to double check all of your settings and property information in myallocator for accuracy, but it also means NO ROOM MAPPING and no settings mismatch headaches. For more information on TripConnect instant booking, click here. 3. Make sure your Address, phone number, and tax percentage are up to date. NOTE: The Tax Rate entered on this screen MUST MATCH the Tax Rate entered in Step # 7.9! TripAdvisor uses this information when displaying your property and calculating a total for a guest at check out. Next, verify that you have a credit card password set to receive payments. If you need help setting up your credit card password, click here. The last item to verify in your myallocator configuration is the Room Setup screen. 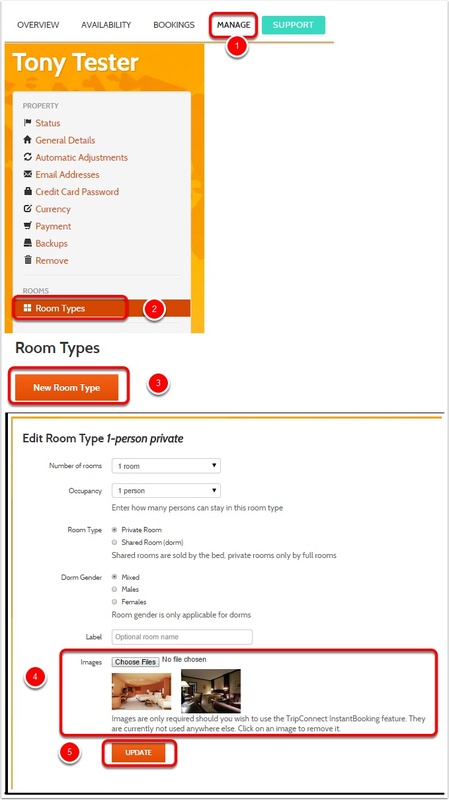 Pictures of each room type are required for Trip-Connect instant booking. New Photos can be uploaded by clicking the "Choose File" button, selecting a picture from your computer, and clicking "Update." NOTE: If you have not correctly set up the information in Steps 1-3, you will be warned when you try to enable instant booking from Channel Set Up. If you are missing any information, just click the "Resolve" link, and you will be directed to the appropriate screen to enter the missing information. Once all property information is entered, this section will change to look like this, and you are ready to continue. Continue down the form, enter your general preferences and TripAdvisor ID. Pay special attention to the Refund choices, as they must be consistent with your policy text later. Set your Cancellation choice and make sure it matches your policy text later. Continue down and enter your rate adjustment, as you would for any other channel. Next, fill in your policy text. NOTE: It is very important that the text you put in these boxes does not contradict the policy selected in the first section. Having a refund (1) or cancellation policy (2) that doesn't match your earlier selection will cause confusion for potential guests and create discrepancies in bookings. After filling in your policies, double check to make sure everything looks good before clicking "Save." Important: You must wait 48 hours before proceeding to step # 6. 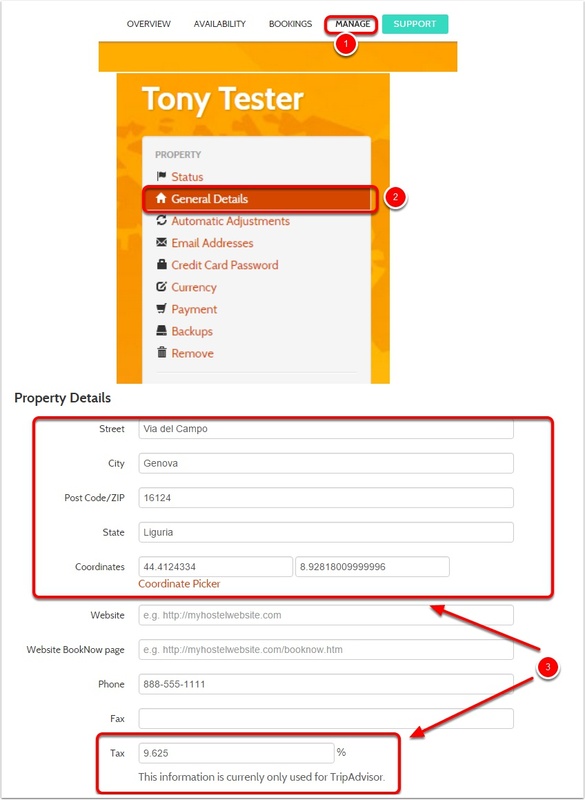 Click on "Check Your Eligibility"
Under Connectivity Partner, choose "Cloudbeds' Myallocator"
Verify the dates, rates and rooms and click Correct. Note: If this information does not match, please make sure you have waited 48 hours as mentioned in Step #5. If you have waited 48 hours and the information still does not match, please contact myallocator support at support@myallocator.com or by submitting a ticket at: myallocator.cloudbeds.com. Read through the Tax options very carefully, and select the proper option based on your rates and taxes. NOTE: The Tax Rate entered here must match the option set in myallocator on Step # 1.3! Congratulations! TripAdvisor Instantbooking is now setup and ready to use. 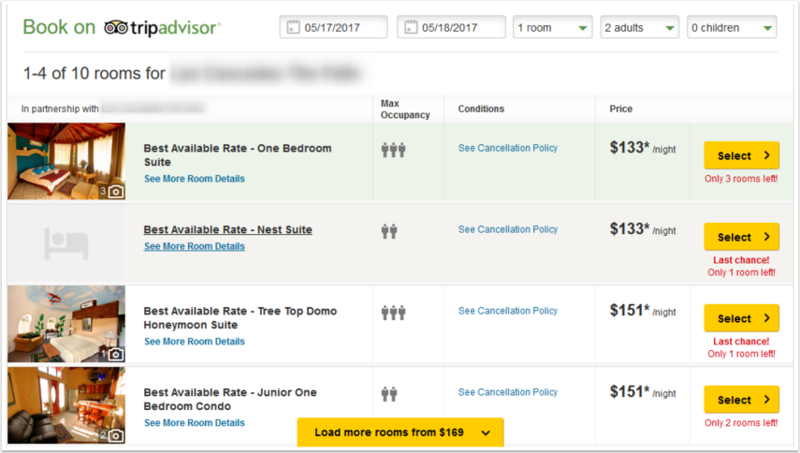 Within the next 24 hours, travelers will be able to instgantly book rooms at your property on TripAdvisor. When active, your InstantBooking option will display a "Book Now" button, and guests will be presented with the option of paying for the booking directly within TripAdvisor, as shown below. Explore the Dashboard to learn how you can track your instant booking performance. The Dashboard page will show you a snapshot of your performance. Click Booking Activity Report for a more detailed report of your booking history. Click Transaction Report to obtain details regarding the financial transactions you have received. Place the booking from within the United States, United Kingdom, Ireland, Canada, New Zealand and Australia. Only 25% to 50% of the guests will be presented with the Instant Booking option, depending on the commission model you selected with Tripadvisor. To find out which ratio your property will receive you will need to contact your Trip Advisor representative. Once they select tripadvisor as the booking source, they will be presented with the booking options for each room, as shown below. 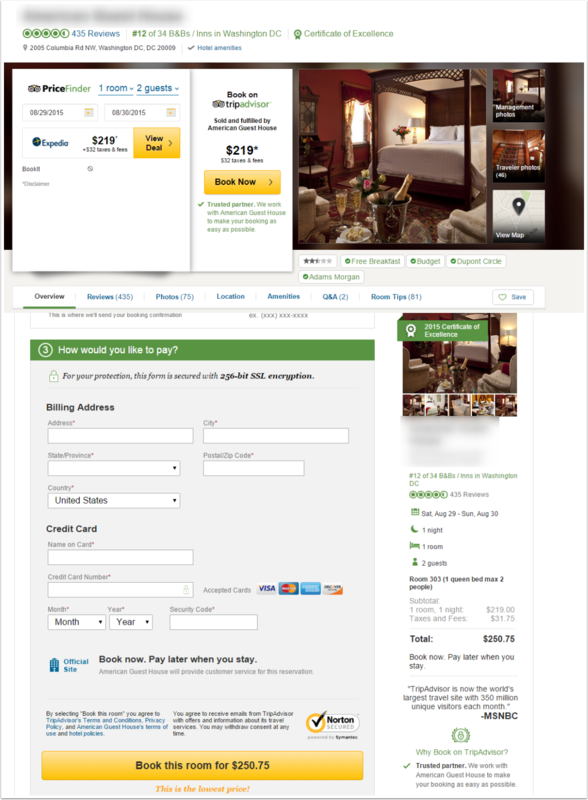 From there, the guest will complete the booking process directly on Tripadvisor.com as shown below. Shopping your property as a guest does not determine if Instant Booking is enabled. At this time those countries are the United States, United Kingdom, Ireland, Canada, New Zealand and Australia. If you experience issues after setup, please consult the suggestions below. Another possible reason is that the button will only appear 25-50% of the time depending on which commission model you chose with InstantBooking. To find out which ratio your property will receive you will need to contact your Trip Advisor representative. If you only sell (or have available) dorm beds, the Booking button will not be available to guests. 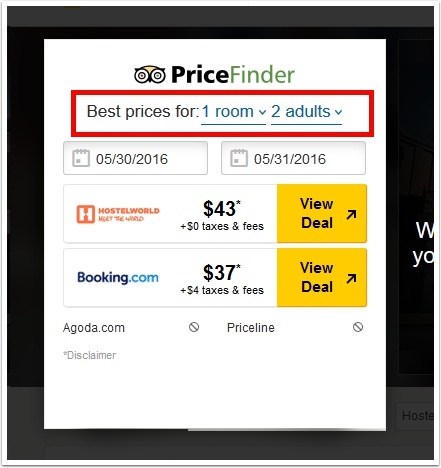 This is because Tripadvisor's default search option is always for "1 Room, 2 Adults". Since a dorm bed only allows 1 person, the available beds do not show up in the first search that a guest performs. The guest can of course change the search to "1 Room, 1 Adult". But by that time, the window for Instant booking has already passed. In short, dorm beds do not appear in the search options for Tripadvisor InstantBooking.